Its been a while since I've blogged, once again life has taken over and I've had very little "me" time. 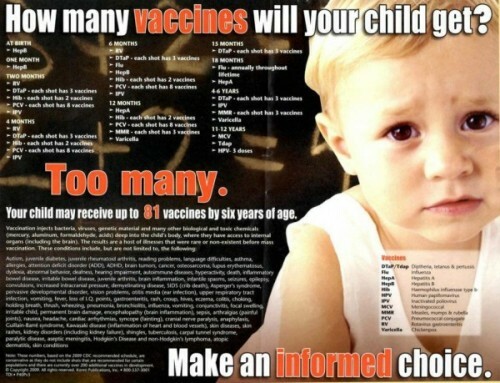 A major development in my quest for better health has been our decision (read: my decision) to not immunize our children. Sure Lil D has had all her vaccines up to 18 months, but that will be all for her. I've got 3 years to figure out how to get her registered into a public school without having the "recommended" vaccines, I'm sure it will be an interesting journey. For a comprehensive explanation of each of these ingredients here. (2) A high immunity to disease doesn’t come from a needle, pill or supplement. It doesn’t come from antibacterial soaps and a germ free environment. Actually, considering the poor state of health most people are in these days, it can’t even come from healthy food and medicinal herbs alone any more. The epidemic of allergies, asthma, obesity, gastrointestinal infestations, infections, malabsorption and so much more are all directly related to poor immunity. It all comes down to the body’s own defense systems and how well or poor these function. (6) More vaccination information from Share Banoosh here.